Grind them to a smooth paste with little water. Heat oil in a pan, add the seasoning ingredients. Add the green chillies and saute for a min. Add the chopped onions and fry them until they turn translucent. Add the chopped tomatoes along with turmeric powder, coriander powder , chilli powder. Mix them gently. When the tomatoes gets cooked well, add the grinded paste along with salt and sufficient water.Allow it to boil for 5 min. in a low flame. Turn off the flame and garnish with coriander leaves. Oh! My mom cooks like this. Great recipe. Aruna,, tomato kuruma looks yumyyy and i like this kuruma very veryyy much with idli.In coimbatore this kuruma is very traditional one with idli... if i cook this kuruma means will eat 2 more idlies extra.Thanks for sharing dear,,take care n keep smiling. 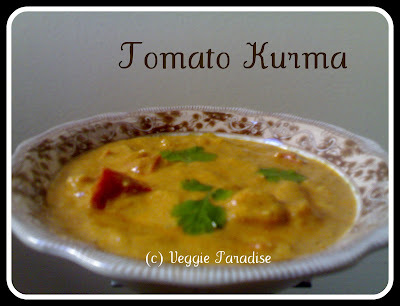 wow.. its really fantastic & looks delicious.. nice click..
tomato kurma looks very thick and nice colour yellow and red! Kurma looks delicious, nice recipe. kuruma only with tomato wow...nice. Tomorrow,idly dhaan,try pannittu sollreyn :) Sounds super yumm! 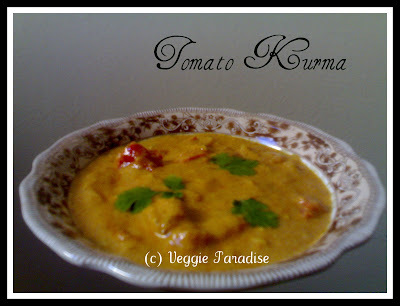 Very yummy tomato kurma. Love the recipe. 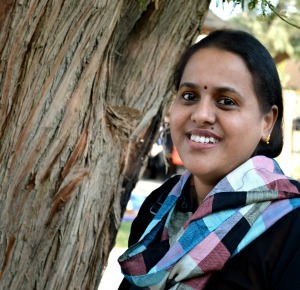 Wow Aruna it looks delicious. In my family ppl do it from that green tomato. loved the recipe.. looks delicious..
Looks tempting ... great recipe !! kurma looks beautiful and yummy...perfect with roti..
Lovely color, looks tempting and yummy. Good one when we run out of veggies. Had no idea that kurma would be prepared with out any extra veggies other than tomato. I can have numerous idly with this superb kuruma. So simple to make , yet tasty to the core. Nice recipe dear. Lovely recipe dear...kurma looks really tempting!!! delicious tasty kurma.. i have made it too. my mil makes this kurma...love it! 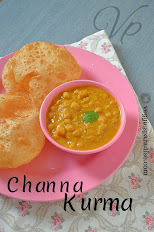 Looks wonderful, creamy and rich...hearty dish to go with rotis or nan. kurma looks simply uperb, delicious and inviting!! !